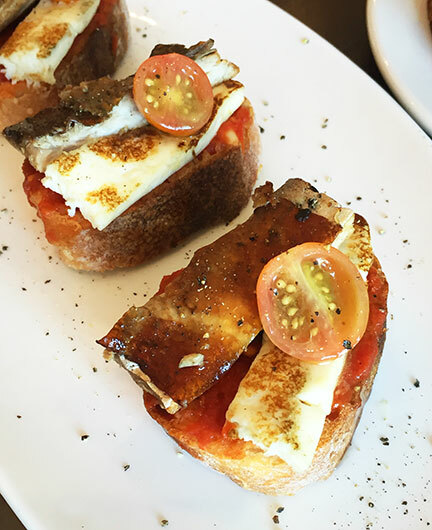 It was a recent European trip that inspired Chef Ariel Manuel to conceptualize Un Cuenca. And while the menu reads mostly of Spanish dishes, Manuel explains that it’s more Spanish inspired Filipino cuisine. 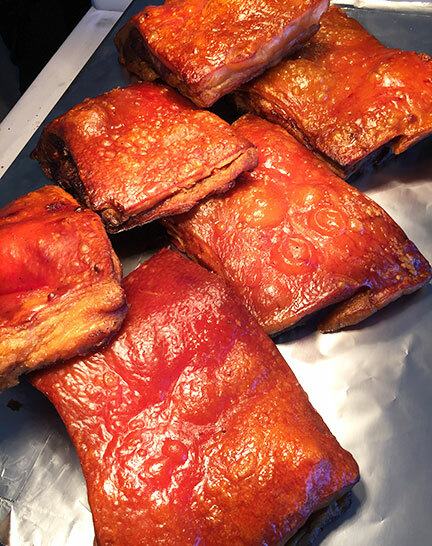 The star of the restaurant is, of course, the much talked about pugon roasted lechon belly. Expertly cooked for three and a half hours in a coal fired oven; the incredibly crisp skin shatters as it is chopped into glistening, succulent cubes. This is served with a sauce made with liver, giblets and mustard; though the meat is flavorful on its own to go without. Regulars usually come in and just order a plateful of the pork and white rice. But their arroz dishes are not to be missed. The mushroom, tomato and pea topped Arroz Valenciana appears plain. But umami just fills the mouth with every spoonful as the jamon bone caldo used to cook the rice with permeates every grain. The squid ink rice provides an even deeper, smokier flavor. 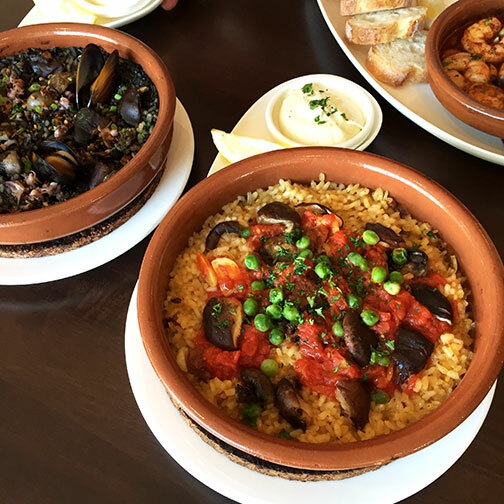 The arroz are served in cazuelas; piping hot from the stove, straight to the table. Filipino twists are found in specials as the lamb kaldereta with dried mangoes, deep fried chicken wings adobo with chocolate sauce, bangus tinapa and fried kesong puti pintxos and fresh lumpiang ubod with local garlic sauce. 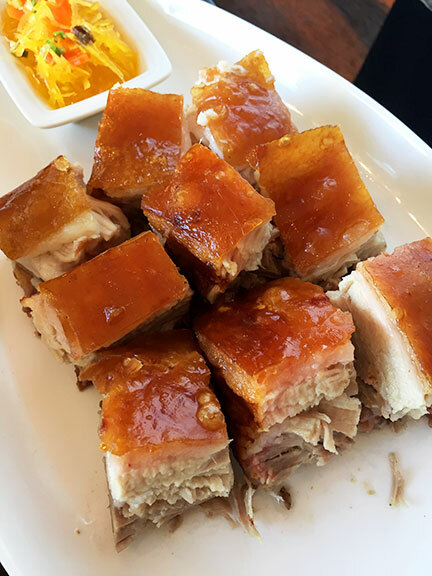 But when asked what the Chef’s favorite dishes would be, aside from the lechon belly of course, he surprisingly pointed out the more straightforward ones. As the Gambas. Which arrived swimming and sputtering in olive oil, toasted garlic and pimenton. 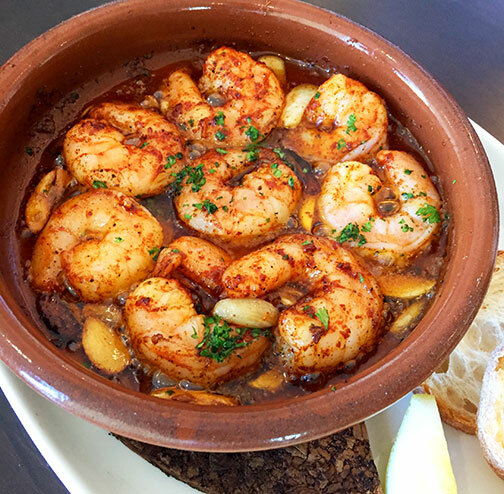 The shrimp, precisely cooked to temperature, remains plump and snaps when bitten into. 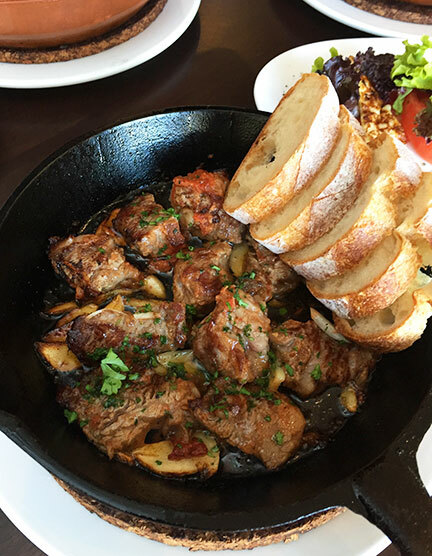 The salpicao, made with US prime ribeye, comes sizzling in a hot cast iron skillet; the beef melts in the mouth like a well-marbled steak should. More than the influence of the cuisine per se in provincial Europe, it is the concept of shared plates and family style dining that set Manuel on his current direction. There is less focus on ambiance and formal surroundings and more attention given on what actually goes on the plate. Food should be served hot, flavorful and crave-worthy. Something people can easily identify with, relate to and keep coming back for. Not to say that he has gone all rustic with his cooking. The principles, methodologies and precision of his French culinary training are still evident in Un Cuenca’s deceptively simple dishes. People usually start to come in around 5PM, order a carafe of the sangria, the white rum laced queimada, or a bottle of wine at the liquour shop next door (no corkage) along with a plate of tapas and just hang out by the terrace. This is the exact picture Manuel had in mind for Un Cuenca. And it seems like a good fit for the laid back Alabang community. He confesses that there were many lessons learned from his many years in the fine dining industry and that he would like to move forward from the shadow of the much loved and multi-awarded Lolo Dad’s. But with food this good, that would seem like a very hard thing to do.